Alive is aging well. At only nine years old, it looks like it could join the great screen adventure classics. 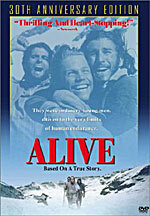 based on a harrowing true story, Alive tells of a planeload of rugby players who crash in the snowbound Andes. Some survive, thanking their lucky stars that the tragedy is over and that they are still alive. As the days pass without any sign of rescue, a slow realization sets in that the tragedy is not over, and their lives must change if they are to survive any longer. The freezing wind and blowing snow are not the only obstacles to survival; hunger, wounds, and lack of equipment forces the survivors to form a new, mutually-dependent society. Eventually, after months of merely existing, three hikers set out to the West, hoping to reach the green valleys of Chile. Most of Alive was filmed on location, on the side of a mountain. The Canadian Rockies make a stunning and beautiful stand-in for the Andes. Director Frank Marshall chose to shoot the film in sequence so that beard growth and sun exposure would look more natural. Alive survives the test of time, not because of its technical accomplishments, which are noteworthy, but because it is an epic, timeless story, told well. Alive is not quite on a par with Lawrence of Arabia, but it is playing on the same course. It’s a bit of creative marketing to release a “30th Anniversary Edition” of a movie that’s only nine years old, but that’s what Touchstone did. The “Anniversary” refers to the real-life events depicted in the movie, and not to the movie itself. The bonus feature Alive: 20 Years Later was already produced and released on the laserdisc version of the movie. The survivors are interviewed about their return home and their life in the intervening 20 years. Many of the survivors speak about being ostracized from their friends and churches. The newest feature, Return to the Andes, commemorates a 30th anniversary trip that Nando, one of the survivors, takes back to the site of the crash. He and several friends drive, ride horseback, and finally hike to the lonely mountaintop. Ironically, the pilgrims came in from Argentina, from the East, where it’s only one day’s hike from base camp. As the movie shows, the hikers traveled West, thinking they were closer to Chile than to Argentina. If only they had traveled East instead of West, more might have survived. After 30 years, Nando is philosophical. He sees no need to rehash what could have been. He seems to finally be healed. Nando implies that the film helped heal old wounds. Twenty years after, the film had not reached audiences and Nando the survivors were ostracized. Now that the film has become a worldwide hit, Nando is again a whole person. Return to the Andes is a testament to the healing power of film. Although it’s nine years old, Alive is still one of the best-sounding movies in my collection. The airplane noise, the crash scene, and the avalanche scene all put you in the middle of the action with outstanding surround sound. The DVD doesn’t sound much better than my laserdisc copy, which speaks more to the original sound design than it does to the quality of the medium. The DVD presents the movie in its original 1.85:1 aspect ratio. The picture still looks good. The stark mountain setting is gorgeous. And although the special effects aren’t quite as cutting edge as I had remembered them, they are still very good. The picture, the sound, and above all, the outstanding true story make Alive a must-see.